The Omega Constellation calibre 751 collection was powered by the last great series of high-value movements manufactured by Omega before the onset of the Swiss Crisis of the mid-1970s. The day-date calibre 751 can trace its origins back to the famous chronometer calibre 551 and is every bit as good as its mid-500 calibre siblings. And judging by the number of enquiries I receive about these Omega Constellation models, interest in collecting them is increasing. As the prices of calibre 551, 561 and 564 Constellations, particularly Pie Pan models, continues to rise, new and often younger collectors are entering the field and taking a shine to the calibre 751 Constellation collection. These models represent an affordable entry point into the world of collecting chronometer grade watches. Hi! I'm interested in ur Omega Constellation Calibre 751. Is it for sale? If yes, please send price detail to: jayleong18281@hotmail.com. Hi, I just mailed you somewhere, now found this comments page so here goes again. Is is possible to have an authentic Constellation 751 in 14ct solid gold that does not have the observatory & stars but does have a totally plain gold back to the case. I found it listed on eBay, movement No: 23,029,475, case No: 168.029. It is "C" shaped with a knurled bezel, the dial "T Swiss Made T". "hi yes thats why it is very rare made for the american market and some europearn countrys . how many 14ct ones have you seen exactly the same......none! I have only seen plain gold backs on Seamasters I think. Very interested in your comments. The markings on the inner case back of this watch appear correct. Rather than this being a 'rare' example, and it always amazes me how loosely and self-servingly this term is used, this is most likely a "presentation" case back. 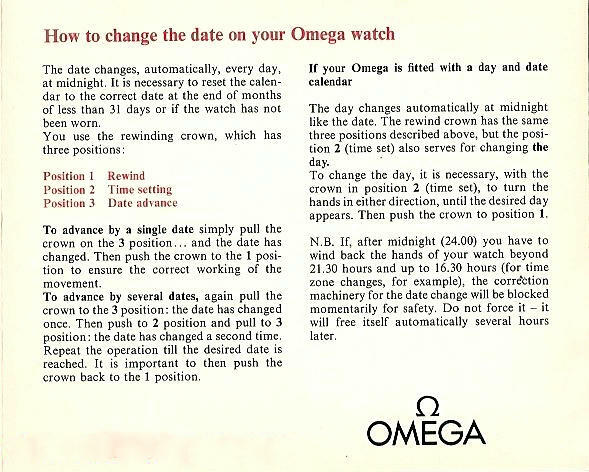 In the 60's Omega offered this service to companies, etc., as it was a tradition in many parts of the world to give gold watches for long service, a tradition, sadly, no longer observed. So "rare" it aint. It is rubbish that this was "made for the American market and some European countries" - it was available to all on special order. Now the real question is, "Is the watch collectible?" I would argue that it is significantly less collectible that a C-Shape that show the observatory medallion. Thanks Desmond, very helpful. Great website. It has given me invaluable information on which to base my decision to buy Constellations. Bought recently an 18ct solid gold 'C' shaped 1966 Cal.561 ( not over 1). It is 100% authentic, never refinished but as good as the day manufactured. Got it at a great price, just GBP £800 and only required a service. I am fortunate to have the services of an Omega trained watchmaker who overhauls anything I purchase. First, thank you for this resource. I am a new collector, and used your website as a platform for gaining knowledge to buy. With that knowledge I purchased an Omega Constellation Cal. 751. But the more I look at it, the more doubts I now have that it may not be authentic. I noticed (today) that the case number reads S.F. 168.019. What is S.F.? I see no record of it. And secondly, the watch, from the pictures, appears to missing the mirror finish. Otherwise everything seems to be in order. Will you take a look? You can find it on ebay. Here is the link: http://cgi.ebay.com/ws/eBayISAPI.dll?ViewItem&item=250678726420&ssPageName=STRK:MEWNX:IT#ht_6980wt_1139. The item number (if that doesn't work) is as follows: 250678726420. SF is a case makers mark. The dial is correct and original, and an excellent example of a well preserved silky guilloche dial, the movement is very clean and generally this is a nice piece. The original finish of the case is still mainly there and the chamfer on the case edge is observable. generally it isnt a bad buy at all. I'm so glad that I had found your website. I have a Omega watch that is exactly the same as the picture in your blogpost. This watch was given to me by my father and how can I find out if it is a real Omega watch? BTW, this watch was given to my dad from a friend. Best way to authenticate is the have the case back opened and take a pic of movement, caseback and also the dial. Click on about me - and send me the pics and I'll take a look. 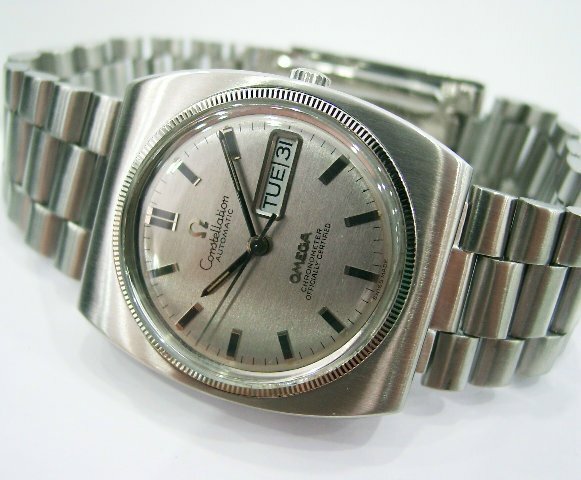 We chatted once on watchuseek forum for my stainless steel constelation connie, I just came across one more which has a 751 movement with a 168.016 case however the dial is quite damaged and my search for a new dial for it seems quite frustrating. I have tried otto frei, AG thomas and ebay and surfing the net still could not find one. I was wandering if you could help me by recommending a few sites which could have it instead. Ive seen a couple around Eric. Gisbert Joseph had one and if you click on the Watchco link on rh side of blog, you may wish to email them and ask if they either have one available or know how to source one. Yes, looking at the case back your watch is 18k white gold. It has a beautiful "silky guilloche" dial and the movement is looking very clean. 18k white gold versions of this model are less common than the gold and rose gold models. I would like to send you a picture of an Omega Constellation 18K Yellow Gold including watch band circa late 60s-1970 men's watch. I have the box. I would like to know its value. It was my father's watch. My Mother bought it new. It seems to be in excellent condition compared to the pictures I have seen of similar watches. I would consider selling it but that is not my goal. Feel free to open a post on this blohg with your email. I will not publish it. Happy to have a look at some pics. thank you very much dear Desmond! Thanks for a great blog and resource. I inherited one of the famous BA168.023 ‘Golden” Seamasters in solid 18K Gold. There is very little information about the watch other than the often mentioned, less than 1,000 produced, and its rarity. I know this is not an appraisal service but I was wondering if you or a reader can point me in the right direction to determine an approximate current value for this Omega. I have Emailed you too. I have written in he past. I have a 551 14k Constellation serial 167005. The Dial was sent out for refinishing and was lost. I have spent all sorts of time looking to replace it but haven't been able to. The dial measures 29.35mm. Can you do or tell me anything to help me. Can you tell me how the case was originaly finished? Mine is all polished I wondered if the sides or top should be brushed? Have a look at the essays under Good Buys and click on the one about the C-Shape. Details of finish are in the essay. Hi THank for your quick answer yes reading the PDFs now thanks. S.T 168.0019 on Omega Vintage Database? Have you heard of S.F on case backs? The extra 0 has been added to comply with Omegas internal electronic record keeping. So casse back 168.019 equals 0019 on the database. Re SF, it is a case makers mark but I cant recall which maker. Desmond, I ran across a version in a small shoppe in Nuremberg and the Days were in German. Is this a version that existed and if so more or less collectable than in English? Yes this is normal for German market Constellations. Most collectible in Germany and German-speaking parts of Europe, perhaps a little less collectible in English-speaking countries. In view of your in-dept knowledge, regarding vintage Omega watches, I am surprised, you do not have a section,exclusively selling vintage Omega watches. I've thought of perhaps offering an authentication service and links to authentic examples, but this is a hobby that can only consume so much of my time. As a hobbyist, it would somehow detract from the credibility of the site, I feel, if I became a seller too....and of course it would certainly bite into the time I allocate to enjoy the experience of researching, writing and collecting vintage OMegas. Am I right to suggest that the quality of an Omega movement (pre-1983) is close to that of a Patek Philippe, in general? However, the price of Omega is only a fraction, relative to Patek Philippe's. How did Omega achieve this and yet, Rolex outsells Omega in terms of quantity, sold? Patek movements are hand finished with a high degree of decoration on the plates and also on operational parts such as regulators. Also the manufacture of hands and dials demands perhaps more craftmanship. Omega movements up to calibre 751 were of course a production series movement and while there was much handling and hand finishing (30% of its workforce was involved in quality) the degree of human handling was much less than in a Patek. Rolex and Omega are about the same 'quality' and then pricing differentiates today, but in the 60s and 70s Omega was priced higher than equivalent Rolexes generally. Omega in those days was considered the better watch as sales and COSC numbers (the 60s equivalent of COSC actually) of Omega chronometers attest. There are many variables to consider when comparing Omega to Patek, but the ones that count such as true quality (finishing where it counts on pivots, teeth and bridges; quality of metals; horological design; robustness; and most certainly precision and accuracy) there isn't much difference at all between a 60s Patek and an Omega. Hi Des. I just purchased a cal.751 in a steel C shaped case. Condition is beautiful. Dial is the silver colored silky guilloche finish. Were any of these dials ever made in gold for the steel cased models? Thanks. Firstly, congrats on your acquisition. Simple answer is no. These guilloche dials followed the case metal. Ive seen a few solid yellow dials around (probably through some heretic scrapping the case for gold value) and have been temped to buy and swap, but, then, the compromise is to lose factory originality. A white gold dial would be rare in itself though as few white gold ensembles were made. I need your help, i have this model, received as gift from my father. Since long time did not work anymore, I would like to know where can I repair it. I am living in Germany, therefore to send it to Switzerland is not a problem at all. Can you recommend me some place in Switzerland or Germany or Europe? One idea would be to take the watch to an official Omega service agent in Germany. Agents will usually send vintage watches to Omega in Bienne to be repaired and restored. This is quite expensive. The other option would be to take the watch to a reputable watchmaker in your city/town who has worked with Omegas over a long period and ask him to quote you on repair/restoration. I'm currently travelling in Italy until mid April and am accessing emails infrequently. I have bought an original 751 168.045-368.845 steel Constellation. My watch has a Dutch daywheel and that really made me tick. It seems hard to find how many watches where made with different language wheels. would you have any idea how many of the 168.045-368.845 were made with a Dutch daywheel? Thanks for your comments. In regards to how many pieces with Dutch day wheels, Omega doesn't have records that would reveal that information. But, with a little speculation we could have a 'stab'. Population of Holland in the late Sixties was around 12 million - about the same as Australia - small when compared with big markets. Europe was still recovering from WW2 and Dutch migration was still significant, so disposable income was not in plentiful supply, particularly for luxury watches. There may have also been some preference in Holland - being such an 'international' country - for day wheels in English. So I would expect, taking everything into consideration, that possibly no more than 500 pieces with Dutch day wheels would have found their way to the Netherlands. finally got the time to get a small video up of my 168.045 Constellation. I thoguth you might enjoy it. Thanks for all the information! Excellent! I saw the one on the maroon Geneve too. I have the same model 751 as Guido but mine has day/date in Spanish. Were they low production too? Lower production that those in English, but, still, they were exported to quite a few Spanish speaking countries. For the price it went for, I would say that it was a good buy when considering 2014 values. A whole lot of watch for the money. Hi Desmond, this is the second watch ( ref. CD 168.016 and ref. CD 168.017) without the typical "stars in the air". Do you have any explanation? Hi Desmond. I live in CT and sent 2 watches to be repaired in FL. My tag chronometer was returned fixed, but my 2000ish Omega automatic Connie was returned as a broken 1969ish omega auto Connie. They're trying to tell me that's the watch I sent them. It doesn't even fit my wrist. What should I do? Thank you. Do you have any photographs of your original watch, a serial number for the movement, or any such evidence that will identify it as yours. Also do you know anyone close who absolutely could say that the watch you received was not the watch you sent to be repaired? So what I suggest is that you stack up as much evidence as possible and confront them with it, also exploring if you can get the police involved. This is outrageous when you think of it. What was the name of the outfit in Florida? I have a question about this watch- is this blog still active? Omega Сonstellation with Pie Pan dial manufactured with caliber 571? I'm assuming you mean, did a pie pan dial come with a calibre 751 movement? The answer to that question is no, the calibre 751 being a day-date model was featured in later designs that had flat dials. While a pie pan dial did appear in a calibre 1011 model, no day-date models ever had faceted or pie pan dials. I have seen on occasion Frankenwatches that have modified calibre 751s under pie pan dials however. Calibre 751 is basically a chronometer version of the calibre 550 with a day-date mechanism. As such, if one removes the day wheel and replaces the star wheel and longer finger assembly with parts from a calibre 564, amongst other things, a calibre 751 can sit under a dial meant for a calibre 561 or 564. If you have a watch with a cal 751 or are condsidering purchasing one that has a pie pan dial and date only, I would reconsider and walk away. Many thanks for your qualified information! Desmond - I am trying to figure out how to upload pictures. Can you help? The above watch appears to me to be in better condition that similar watches that are for sale online for $5.25K - $14K. I would like to know your estimate of value and where to sell it? Thank you. Your model is a 168.029 Constellation C shape with 'knurled bezel' and powered by a calibre 751 movement. The watch has a solid gold 'silky guilloche' dial and overall the watch presents very well. Some of the original finish of the case, by the look of it, has been polished off at some time, probably during a service. The watch was probably produced in the late 60s, but could have been sold early into the seventies. The serial number on the movement would confirm production year. The bracelet is a genuine 18k bracelet of the time and may have been chosen at time of purchase. A number of different bracelets were available to accessorise the watch head. There is probably around 3 ounces of pure gold in the watch (possibly a little more), being 18 karat. So today's gold price at around 1120 USD means that gold content alone amounts to around USD 3400.00 The higher the gold price, the higher the value of the watch. Does the bracelet have stretching links or are the links fixed? Are there any numbers stamped on the end pieces near the lugs or under the clasp? There are a number of different market values in the vintage watch industry: wholesale, global internet, on-line retail and bricks and mortar retail, B&M retail usually being the most expensive. The wholesale price would be around gold value plus $500, and that's the price under which one would not consider, although some shonky dealers would probably try it on to steal it from you. On-line retail varies significantly from around the 5k to, as you say 14k. The 14k price tag is outrageous and all I can think of is that the seller wants a buyer not only to pay for the watch but also for his children's orthodontic work as well! Global Internet value, that of on-line auction sites like eBay, also varies wildly. But if the watch was properly photographed, including the inner case back and movement, had been cleaned and oiled, and was accurately described (including that it is a one-owner with verifiable providence - original papers would certainly help) I think it would fetch around the 5.5 k mark. Could be a bit more if there were a few competing bidders. I imagine you have read my essay on the C Shape, and while the watch style certainly is less popular that say a pie pan Constellation De Luxe, there is a growing band of collectors of this watch. Where to sell? Possibly on Watchuseek or Purist Pro sales forums, or even eBay if you have an account. I found this beautiful specimen in the Web as follows http://watchlim.blogspot.co.id/2015/10/599-omega-vintage-constellation.html?m=1 . I kindly want to ask its originality as I found its bezel it's not the same as the one I've seen on Google, while I'm keen to buy this piece. Please help with any information you got, I'll definitely appreciate it. Run away from this watch. It is 'put-together' or what we call a Franken watch. Note the train bridge reads calibre 656 and yet the rotor bridge has the chronometer 'adjusted' etc., script. Calibre 565 is of course not a chronometer movement, and what I suspect is that a seller has acquired a tired old C Shape and got it going again by using parts from different movements. The braceletr is not an Omega bracelet, and someone has cunningly attached it to an Omega clasp. As I said, run away from this watch and this seller. Read cal 565 above and not 656. Also note the case number which should have a cal 564 movement and be date only. i'm keen but i will love to hear from you your feedback. Hmm, the dial looks as though it may have been refinished. It is way out of "MOY" (see my essay on the topic) I have looked at my examples and the MOY feature is there. Otherwise the watch seems to be in good order. I would ask for large pics of the dial with the hands at ten past two so you can get a good look at it. Hi Desmond, i realize your MOY article is mostly on Constellation, while this is Seamaster Cal 751 sparkle dial, does it apply the same? from this picture, what is your thought in terms of the dial and MOY feature? Yes, that looks alright. There clearly were variations, and that is not unusual because Omega used various dial contractors. The case on the above example is pretty sharp too. Desmond, I have a watch I would like your clarification on. Do you have an email address? Just post your email address and I wont publish it. I am extremely grateful for your awesome work on Connies. You are the Chuck Maddox of Connies! I would like to ask you for some advice: I'm looking for a 751 calibre and I'm not sure if I should go for the C-shape with knurled bezel or the integrated bracelet design. I have a weak spot for the integrated Omegas and I love my 168.046, so maybe it's a bit foolish to get an almost similar model (368.0845). But on the other hand, the 751 seems much nicer than the 1001 movement. Also the 1040-bracelet with a C-shape is maybe the best of both worlds ... What would you choose? I guess that, if it were me, I'd opt for a different style of watch to the one I have, and choose the knurled besel cal 751 C Shape. They fit snugly on to the wrist and look a treat. What are your thoughts on the 168.016? I have never seen the case in real life, but I think the lugs and the shape of the case seems really nice. It might just not be as collectable? I like the simplicity of the 168.016, and many examples have nice, chunky onyx markers. While currently not as sought-after as the integrated bracelet models and the C-Shape, any watch with a mid-500 series calibre has collectability. Happy to see some pics, just post the URL in a message. My question: are the markers and bezels white gold? They seems different to all the other parts. Your blog is the best, greetings. Yes, the bezel should be white gold. The markers will most probably be rhodium plated in most cases. Nice complete example, and may you wear it well. Thank you Desmond, your blog and knowledge was the best resource about the watch on internet. Thank you for your help.